Several years ago as a college student, I was minoring in secondary education. The intended plan was since I couldn't hack it in computer programming (with visions of being a millionaire like the guys who made Doom in my head) that I should focus on something I was actually good at: history, and teaching it. The discussion in class one day turned to student discipline and keeping order in the classroom. Naturally it went on a tangent about school shootings. And I suggested arming the teachers with taser weapons. It's a wonder I didn't get banished from Elon University right then and there, the notion was so radical and attacked. But this was before Columbine. Now? The thought of a non-lethal stun device seems almost quaint. Under no circumstance is the Second Amendment to be violated. Some may not like it, but the right to keep and bear arms is the absolute final deterrent against government becoming all-powerful and consuming, and that is what the Founders intended. But schools, whether public or private, are special environments where immediate accessibility to a firearm may not universally be for the best. And yet, armed attacks on students and teachers continue. I could deviate a bit about the true cause of such atrocities, but that's for another post. So... what is to be done? Because advertising that a school is a "gun-free zone" does not work, has not worked and will never work to deter a bad guy from storming the premises with a firearm and the intent to hurt and kill others. Give those teachers who opt to be armed the right to do so, provided that they pass extensive background check and pass a mandatory training program tailored to address school violence and the responsibilities that will come with having a loaded weapon on standby in the classroom. Install a lockbox in each classroom. Secured with a real key, not a combination lock. Only the teacher of that room and the principal will have a copy of the key, with another copy kept at the main office and retrievable by authorized personnel or law enforcement requesting the key through proper channels. 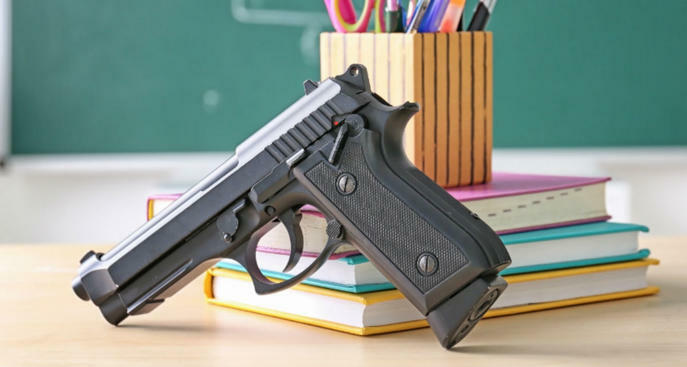 Teachers who choose to bring their firearms to school will be required to check them in at the office every morning, retrieve the key for their classroom's lockbox, and upon arrival at their classroom will immediately secure the gun in the lockbox. At the end of the day each teacher opting to have a firearm available will remove the gun from the lockbox, sign the gun out at the office, and return the key. The gun is kept out of ready reach but in a worst case scenario will still be within immediate grasp of the teacher. There is also a log kept of which members of the faculty are armed for that particular day. It's as responsible and accountable a system as I've been able to conceive. Maybe more learned and wiser minds in regard to school safety can come up with something better. If so, I for one would appreciate knowing what it is. But merely announcing that a school doesn't allow guns, with nice neat placards announcing as much to visitors entering the building, isn't going to save lives. Not from a lunatic whose only thought is to wipe out as many innocent lives as possible before the cops or deputies finally arrive. In this imperfect world, seconds count when help is still minutes away. The psychological value alone in that merits considering arming teachers with appropriate weaponry, to be used as a last resort. As a teacher, who would not choose to carry a gun on campus, or at all for that matter, I do applaud that your plan makes this voluntary. I do not believe that weapons in a fearful or untrained teacher's hands would be valuable in a security situation. However, knowing how much goes on from day to day and the fast pace of mornings, I would suggest, signing out the lockbox key once and the beginning of the year. It would then be that teacher's responsibility to take their weapon back and forth, or to keep that weapon at school. This could just be "one more thing" for principal's to check up on as they make rounds in their schools.